For those who have been tracking Florida foreclosure fiascoes in the news for the past few years — like most foreclosure defense lawyers — there may be a recollection of Judge Harrison’s ruling back in July 2010, where the Court ruled against Bank of New York in a foreclosure case, finding that the bank’s motion for summary judgment was not supported by proper evidence because the affidavit that the Bank of New York submitted to substantiate its request for a foreclosure judgment was not sufficient. Judge Harrison ruled that there were fact issues in play that prevented a summary disposal of that case. Now, Judge Harrison has again ruled in favor of the homeowner/borrower. This time, Judge Harrison has ordered a Florida bank to enter into loan modification with the borrower in a case where the bank came before the bench asking to foreclose on the borrower’s property. Not just an order that the loan be modified: Judge Harrison’s Order tells the bank and the borrower what the new interest rate will be (3.15% over 40 years) and the bank is ordered to mitigate (fix) the damage that has been done to the credit scores (FICA credit reports) of the borrower in the whole mess. 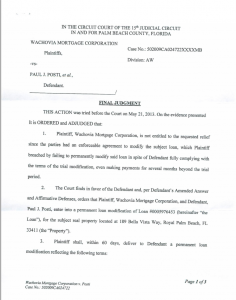 Plaintiff, Wachovia Mortgage Corporation, is not entitled to the requested relief since the parties had an enforceable agreement to modify the subject loan, which Plaintiff breached by failing to permanently modify said loan in spite of Defendant fully complying with the terms of the trial modification, even making payments for several months beyond the trial period…. However, just like the July 2010 action by Judge Harrison, this didn’t get much press. You can read about this victory for Florida homeowners in the Palm Beach Post and you can read Matt Weidner’s commentary on Judge Harrison’s action in Matt’s July 3rd blog post, but this isn’t making the Big News in the state media much less the national news reports. This happens much more often in Florida than many people realize. However, what many people also need to know is that all is not lost in Florida Foreclosure Fights these days — while the media does not cover the Wins of the Little Guy like they tend to do for the Big Banks, those victories are out there. Florida foreclosure defense attorneys work hard with clients across the State of Florida to try and even the playing field against these financial institutions and their bags of tricks. Add to that this reality: there are judges out there who do understand that things are not as the banks would like it to appear – and there are Florida judges who will rule against a bank and for the borrower. Yes, it means a stressful and emotional fight in a Florida courtroom, but justice can prevail. Spread the word. Victory is still available to the Florida home owner fighting for justice against a Big Bank foreclosure. I had similar situations regarding Bank of America. They sold our house at the courthouse last July 12 and trying to unload the house on auction.com. They stopped the insurance on the home last date will be Sept 15, 2013. I am at a loss on how to fight them and cannot find an attorney to take on this wrongful foreclosure. The Securitization Audit and FAS analysis shows the Note and Deed were illegal. 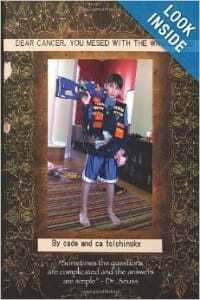 Where can I find an attorney to help us in this case?